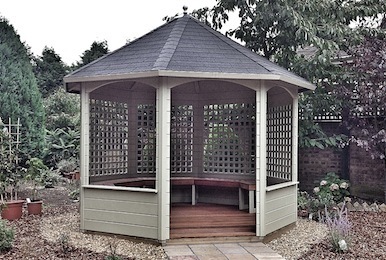 A pergola is a garden feature designed to form a shaded walk or passageway of pillars that support cross beams and a sturdy open lattice, upon which climbing plants can be trained. They can also form a kind of extension on part of a building, as protection for an open terrace. Larger pergolas are ideally suited for linking different parts of the garden, providing secluded areas and creating summer shade. They are also idel for creating shaded areas for seating. We offer a full design and installation service on all types of pergola and can be made with either soft wood or hard wood.